What's the Spookiest thing about Halloween for Orthodontists?? It's the candy, of course! We love your favorite candies too (because, duh... they're delicious), but the abundance of candy present at Halloween is a good reason for us to take a moment to discuss why we should be extra careful with it while wearing braces. There are two reasons that patients wearing braces should be extra careful with their Halloween candy. If you're a candy-lover, then you already know that many of your delicious sweet treats can be hard, crunchy, sticky, or chewy. Biting hard onto candies like this can cause braces to become loosened or break. As you know, broken braces can be uncomfortable and may even cause your treatment to take longer! Sugar!! Candy is full of delicious sugar! EEK! Sugar has a way of finding its way into the nooks and crannies of your braces, and it gives you extra work to do to keep things nice and clean. Sticky sugar is especially insidious since it really wants to stay put. Choose softer candies, and eat them gently. Always brush and floss well after eating anything with sugar! The American Association of Orthodontists posts lots of useful content on their website, and once again, they've provided some answers to common questions we frequently hear. 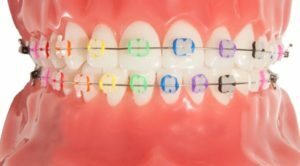 To learn what makes an orthodontists a specialist in straightening your teeth, check out this link to the AAO Article, Is My Dentist Also an Orthodontist? One of our favorite parts of being in Hilliard is the FANTASTIC Recreation and Parks Department! They are responsible for producing incredibly fun and family-friendly events all year long. We have been privileged to be able to participate as sponsors in the Hilliard Fall Festival for two consecutive years, and we want to thank you for coming to visit our table! 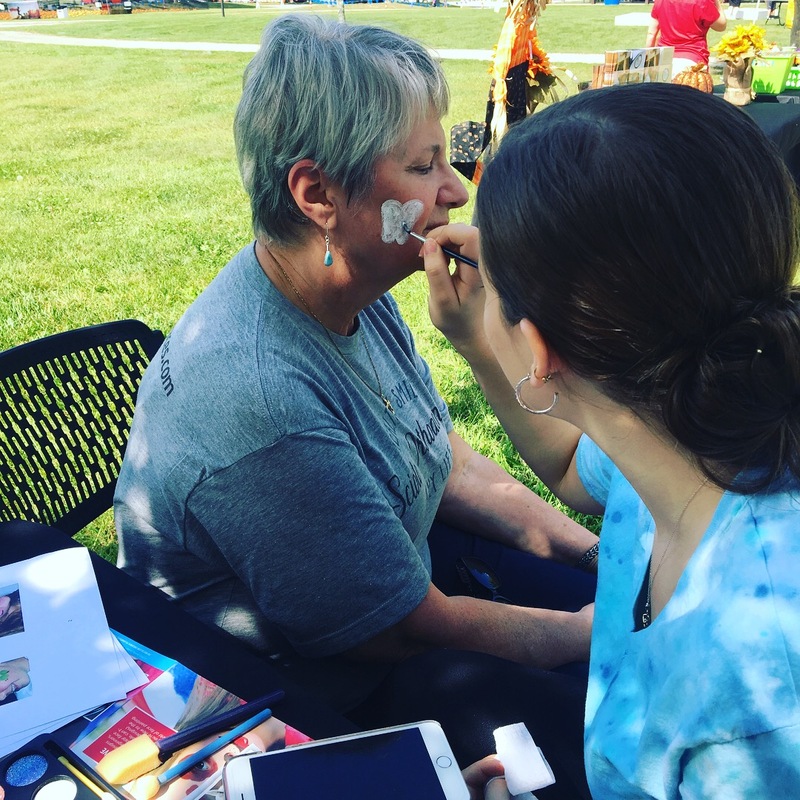 Once again this year, we offered face painting for kids (or adults... we don't discriminate!) and made ourselves available to answer questions about orthodontics, braces, smiles, Invisalign ... anything! Thanks Hilliard!! We hope you'll join us again next year!! With Labor Day ever so slightly in the rear view mirror, it's time to start thinking about fall, right? Pumpkin Spice and soups and stews? Ok, maybe it's still a little bit warm, but we can plan ahead! Fortunately lots of delicious fall foods go great with braces. Soups and stews are some of our favorites to recommend for those first few days after braces have been adjusted. And can you ever really have too much soup when the weather turns cool?? 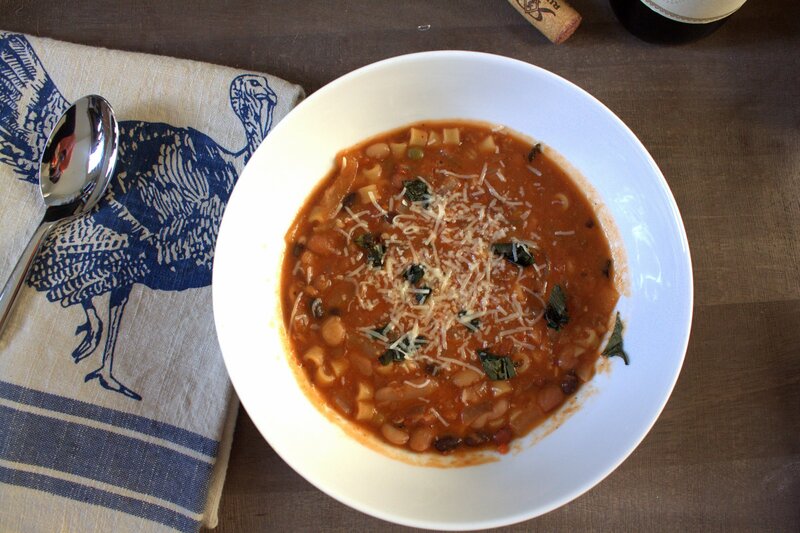 Here's a link to one of our favorites, Ina Garten's 16 Bean Pasta e Fagioli! Today, I simply want to thank each and every one of you - patients, parents, referring dentists, for a wonderful summer! It's hard to believe that schools are in session this week (or even last week as in a few cases!) and we'll soon be discussing pumpkin spice lattes and then gingerbread men. It's strange to notice the sun rising a little later and setting a little earlier. It's more typical these days to hear people talking about the vacations they took instead of the ones they're planning. The end of summer can be a little sad, but I've always loved the feeling of getting a fresh start when fall rolls around! This year, we are celebrating the completion of our first full summer in the new office, and we're celebrating the upcoming beginning of our second year. It seems appropriate that we opened our office in September because the beginning of the school year always seems like a great time for a fresh start. This coming year we're looking forward to being even better than we were last year. We hope to continue to improve our level of service every day, and we'll keep working hard to make you happy! We're sending you our best wishes for a happy, healthy, and productive school year! Thanks for a great summer, Hilliard! By the time your child is about 6 years old, they will likely start to lose some baby teeth and begin to get new permanent teeth erupting. At this time, it's wise to start paying closer attention to how they bite in order to identify developing orthodontic problems. 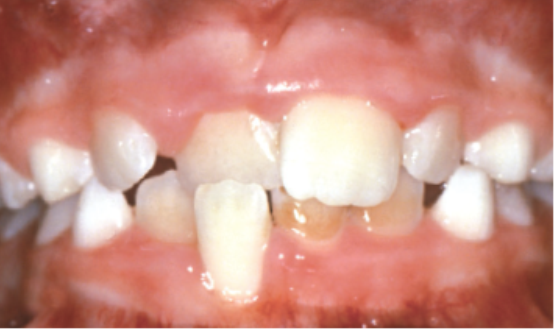 This week's AAO article discusses what to look for in the developing dentition especially the inability to bite all the way together or difficulty chewing. Join Us at the Taste of Hilliard! We're excited to be participating again this year in the Taste of Hilliard event at the Makoy Center on August 8th! Last year, the Taste of Hilliard was the first ever community event that we participated in before opening our office in September, and it continues to hold a special place in our hearts! We loved meeting members of the community - hearing stories from parents about their own experiences with braces and meeting little ones with eyes wide as they checked out our orthodontic treatment models and started proactively choosing what colors they would choose on their own braces. We'll be ready for the crowd again this year, with coupons and giveaways, and one lucky raffle winner will receive a WaterPik, perfect for keeping braces clean! The Taste of Hilliard will be held from 4:30 to 7:30 p.m. on August 8th at the Makoy Center 5462 Center Street, Hilliard, OH 43026. For $15, you can plan to come hungry and enjoy TONS of amazing food from some of Hilliard's finest restaurants. See you there!! Many parents are eager to start figuring out how their child's dental development is likely to proceed, and sure enough, there are clues even in the primary dentition (baby teeth) that can help deduce what orthodontic needs a child may have. This week we are sharing an AAO article that discusses what you should be looking for in your child's baby teeth and why these things are important. The article discusses spacing and crowding of the primary teeth, the importance of hygiene and proper care, the purpose of maintaining the baby teeth for space preservation, and thumb/finger and pacifier habits. Check out the AAO article here, and look for the follow-up post on what to look for in the permanent dentition soon! Have you ever wondered how the magic of tooth movement happens? Sure you've seen the before and after pictures, but how do they do it? Well, in this week's edition of the American Association of Orthodontists resource, we're referring you to a fantastic page that discusses the "how" of orthodontic treatment. This resource covers types of appliances that are used to move teeth. (It's not just all "braces," folks!) It also covers strategies like extracting primary or permanent teeth versus expansion. This resource touches on so many topics that it's likely to raise even more questions than it answers, and that's what we're here for. Please take a look at this website to begin learning, and as always, please feel free to contact our office with any additional questions you can think of. We're here for you!! Many factors come into play when it's time to choose an orthodontist. You're looking for someone who is not only an expert clinician capable of delivering a great result, but likely also someone who makes you feel comfortable, treats you kindly, and ideally is conveniently located so that you can make it to the appointments easily. While it's easy to decide whether you like the office location or your doctor's personality, trying to navigate the waters when it comes to their special qualifications to treat you or your child is a little bit more confusing. 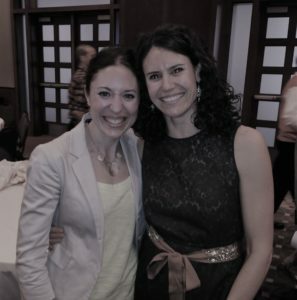 This AAO article emphasizes the importance of choosing a specialist in orthodontics and explains the additional education that specialists complete in order to become orthodontists. In addition, it shows how you can use the American Association of Orthodontists website to find an AAO member orthodontist. By choosing an orthodontist who is a member of this professional association, you can be sure that they are someone who is committed to participating fully in the specialty and continuing their education. In addition to the tips in the AAO article, we also recommend using a few more strategies to select your orthodontist. Visit their website to learn more about the doctor and to determine whether they offer the services you're seeking and/or to see if their treatment philosophy sounds like it's harmonious with your goals. In addition, when you're considering treatment, it's a good idea to ask friends and family members about their experiences at the orthodontist. Most importantly, when you visit the office, make sure you feel that the doctor has spent adequate time listening to your concerns and has provided you with a clear explanation of their proposed treatment and the reasons for this treatment. When in doubt, you can seek a second opinion, usually at no cost! 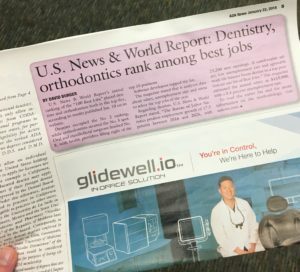 Check out the AAO's article: Choose an Orthodontist and feel free to browse our website for more information! Three Reasons Summer is the Perfect Time to Start Braces! As with many things in life (going back to school, having a baby, etc. ), lots of people feel like it's never the right time to get braces. Well, my friends, good news! Treatment with braces has gotten easier and less invasive than ever. And with so many esthetic options available, you might say there's really no wrong time to begin! However, today I'd like to make a case that summertime is the perfect time to get started! Why? For kids, school is out and schedules are more flexible than ever! Having braces or clear aligners requires a few appointments. Why not try to accomplish these appointments during the summer when the calendar is less full of other obligations? It's a perfect opportunity to take your time learning a new hygiene routine. Learning to brush and floss effectively with braces take a little bit more time, and you should be patient with yourself and make an effort to master the new system. A couple extra hours of daylight before bedtime make this process way more tolerable! You can show off the beginnings of your new smile by the time school's back in session! Braces start to work very quickly. If you're starting right now, you'll already be able to see some exciting changes in your teeth by the fall. And you can enter the school year with a "New Year, New You" attitude! We're here all summer! Give us a call, and we'll help you get started! Today I thought we could chat about one of the common challenges for patients with braces and clear aligners - sports drinks! Many of our patients are in middle and high school. Not surprisingly, at this age, they’re often becoming increasingly competitive in their favorite sports and taking their competition more seriously. This usually means more time spent training, and often, the use of sports drinks for hydration. Sports drinks serve an important purpose. They replenish electrolytes and provide energy for continued exercise. However, due to their sugar content, they present some risks to be aware of. 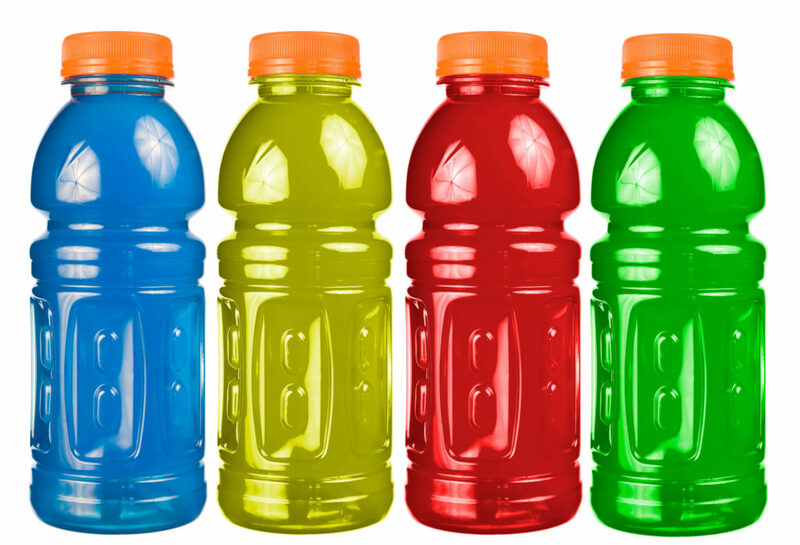 Many children and teens think of sports drinks as “healthy” because they go hand-in-hand with sporting events, but as far as your teeth and your blood sugar are concerned, they essentially behave no differently than soda! 1. Use them only during sports. It isn’t necessary to drink sports drinks throughout the day. They’re meant to get sugar and electrolytes into your bloodstream quickly for use during activity. When used at other times of day, they provide empty calories and no advantages compared to fueling and hydrating with healthy foods and water. 3. Never use sports drinks while wearing clear aligners. The fluid can get trapped against your teeth under the aligner and result in prolonged exposure of your teeth to the sugar. The worst part is that your saliva can’t reach the teeth to rinse them off, and the result is much worse than simply sipping the beverage with an empty mouth. If you keep these tips in mind, you should be able to use sports drinks AND enjoy a healthy smile!! Another common concern that can be addressed at home is a brace coming loose. You'll be able to tell that a brace is loose by feeling it. When you push on the brace, it will move up and down. It may even come completely unattached and fall out of your mouth. Why do braces come loose? There are a number of reasons, but the most common is related to eating. Eating foods that are especially hard, crunchy, or chewy can easily result in broken/loose braces. Patients often tell me that a brace came loose spontaneously. Odds are, the brace was loosened while eating and not noticed until later. No matter what the case is, don't panic! Call the office to let us know that the brace is loose, and we can help you decide if we should make a special appointment to repair the brace or if it can wait until your next visit. If the brace is detached, you can remove it from your mouth. If there is a remnant of wire sticking out where the brace came loose, you can treat this as you would any other poking wire. (See my post from two weeks ago.) In other words, use wax to protect it, or clip the wire if you're able. How do we decide whether the brace needs to be replaced as soon as possible? It depends on several factors including which part of the mouth is affected and how close you are to completing your treatment. If you've had a brace come loose, don't feel bad! While the goal is always to complete treatment without any loose braces, it isn't uncommon to have one or two become unattached during your time in treatment. If you're able to pinpoint the reason, then it can be a learning experience that can help you avoid more loose braces in the future! I've decided to write a short series on at-home solutions for common orthodontic problems, and today I'm starting with the most common - the poking wire! Sometimes wires can shift inside the mouth for various reasons, and often this results in discomfort if the end of the wire can catch the lips or cheeks. First, let's talk about why wires might start to shift after your appointment. A common reason is space closure. When space closes between your teeth, the wire that supported them may be too long for the new position of your teeth. This is very normal and to be expected. Sometimes it's minor and doesn't result in discomfort, but in other cases, the space closure is substantial and the wire may poke. Another common reason is improved alignment of the teeth. As the teeth (and thus the brackets) get straighter, the wire can slide more passively within the brackets and may shift to one side or the other. Another common cause of poking wires is breaking or bending. Wires can be broken or bent by chewing on foods that are a little too hard, or using hands and fingers to manipulate the wires. No matter how your wire has gotten out of place, the solution is usually the same! First, we suggest using the strips of wax that we gave you when you started treatment with your braces. If you've run out, you're always welcome to visit the office to receive more. You can also normally find orthodontic wax in most drug stores. Take a small piece of the wax and warm it between your fingers before "smashing" it onto the sharp end of the wire. If you find that this is ineffective or you desire a more permanent solution, you may use a small wire clipper (or as is more commonly found in homes, a pair of nail clippers) to cut the end of the wire shorter. Don't worry about ruining the wire - it can be repaired at your next visit! We always work hard to provide you with useful solutions that help you avoid extra trips to the office, but if these fixes don't work for you, you are always welcome to schedule a quick appointment and get our help to take care of the issue! Your comfort is our top priority! If you had an experience like ours with braces in the 90's, it's not unlikely that you were one of many lucky kids who got to enjoy wearing a headgear! Today, as you anticipate bringing your children to visit the orthodontist, you might be a little bit wary, wondering if they'll have to deal with the same hassles that you did. While many things are the same, the good news is that there have also been many advances in treatment - namely in the form of new appliances that can make treatment more successful, faster, and even more comfortable for patients. Today, we want to introduce you to the Forsus appliance. The purpose of a Forsus appliance is to improve "overjet." (Overjet is when the upper front teeth are too far ahead of the lower front teeth. Many people also think of this as "overbite.") It can be used for the same purpose as a headgear, but it has several advantages. The appliance doesn't have to be placed and removed by the patient, so it eliminates the need to rely on our patient to remember and be compliant with wearing it. Unlike a headgear, a Forsus appliance can be used in both children AND adults! Most people won't even realize that you're wearing a Forsus. It sits near the back of the mouth and often can't even be seen on smiling! This is advantageous because the Forsus can be worn 24 hours a day (in order to be most effective) without being removed for special events, etc. The Forsus relies on gentle pressure, not a heavy force to move the teeth. This means that it can be far more comfortable than some appliances of the past. The Forsus appliance can accomplish many of the same goals as rubber bands. It doesn't eliminate the need to wear rubber bands altogether, but it can provide additional benefits that exceed the power of the rubber bands alone! 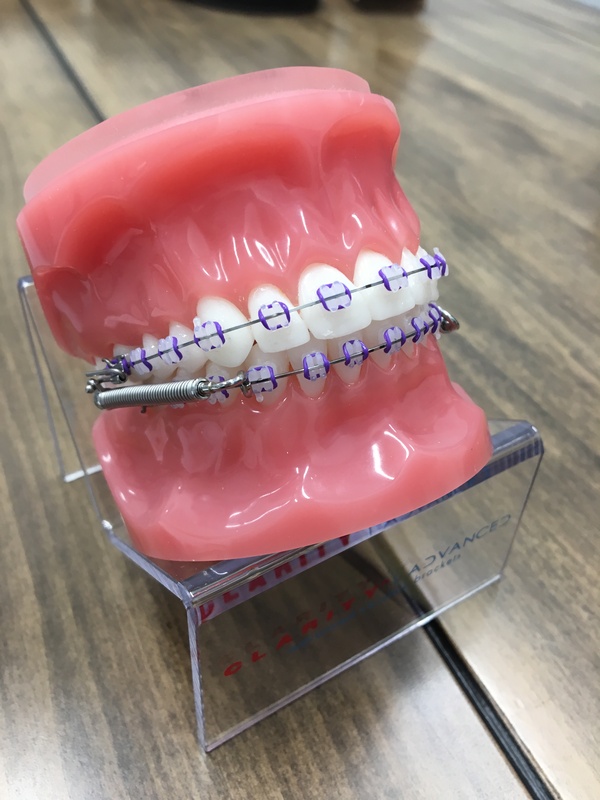 Lots of patients are surprised when the learn about the advantages of the Forsus appliance, and many even tell us that they prefer wearing these springs when compared to rubber bands. Please feel free to take advantage of our complimentary consultation process to learn whether a Forsus appliance might help you reach your treatment goals! It has become common practice to use the word "Invisalign" when referring all clear aligner treatment, but what many patients don't realize is that there are lots of companies who create clear aligners or the tools to make them, and they each have their own advantages and disadvantages. As orthodontic specialists, we are pleased and proud to be able to offer a wide variety of these options so that we can best customize your treatment experience. Today we want to share with you some information about a treatment option provided by a company called Orchestrate 3D. Orchestrate offers tremendous flexibility which means that treatment with aligners can be within reach at a vast range of price points and timelines. Many other companies have "minimum" price levels or entry points that make treatment cost-prohibitive for patients who need minimal intervention. Sometimes for these patients, the perceived value of a minor touch-up isn't worth making a large investment. Now, by using the services of a company like Orchestrate, we can provide service at a price that matches the value. Another advantage we get to enjoy with Orchestrate is maximum flexibility in treatment planning. As the doctors, we customize the movements that the teeth will go through and the speed at which they will move ourselves instead of delegating this part of the process to a technician as is the case with other competing aligner companies. Since this is the case, we can use our experience and expertise to predict how and where each tooth needs to move and what attachments need to be placed in order to achieve the best results possible. Finally, we're excited for what the future holds with a company like Orchestrate. We hope to upgrade our in-office technology at some point to include a 3D printer. These printers allow us to make models of the predicted movements of the teeth right there in the office on the SAME day that the digital impression is made! What does this mean to you? It means that instead of waiting days or weeks for your aligners to be fabricated and shipped back to us, your treatment could potentially begin almost immediately. As we all know, once you've committed to making a change, sometimes you simply can't wait to get the ball rolling! As I've mentioned, we're so excited to be able to offer Orchestrate treatment as well as many many other options to customize your personal plan. Call our office or visit our website to learn more - we would be happy to see you for a complimentary consultation to help you learn what options might work best for you! When it comes to taking good care of your braces, one of the key factors is making great choices when choosing foods to eat! There are a few factors to consider when you're choosing braces-friendly foods. We don't "forbid" very many foods as they did in the past, but we recommend using common sense, a gentle bite, and great hygiene in order to continue to enjoy most of the foods you love. In many cases, simple substitutions can make a poor choice into a good one! Here are the primary factors to consider when selecting foods to eat with braces. Comfort! When you first have your braces placed or adjusted and for the day or two following these visits, your teeth will be a little bit more tender than usual. We suggest choosing foods that are easy to chew but that require you to use your teeth nonetheless. Using your teeth for gentle chewing helps to increase the blood flow around the root of the tooth and will speed up the process of alleviating that soreness! In other words, instead of limiting yourself to nothing but smoothies and ice cream for three days (which does sound delicious), you should also choose some foods like bananas, steamed veggies, or omelets. Gentleness! What we mean by this is that the foods you choose should be gentle on your braces. We often remind patients that the braces are meant to come off some day, and eating hard, crunchy foods that require you to apply a lot of force to your teeth can loosen the braces early. Examples of foods that could easily cause braces to come loose would include things like chewy/stale pizza crust or bagels that require tearing with your teeth, whole raw nuts like almonds, and raw vegetables like carrots. As we mentioned, however, this doesn't mean that your favorite foods are off limits, but rather that you must change how you eat them. Try tearing off tiny pieces of that bagel and chewing it gently on your back teeth. Instead of whole raw almonds, try slivered almonds. 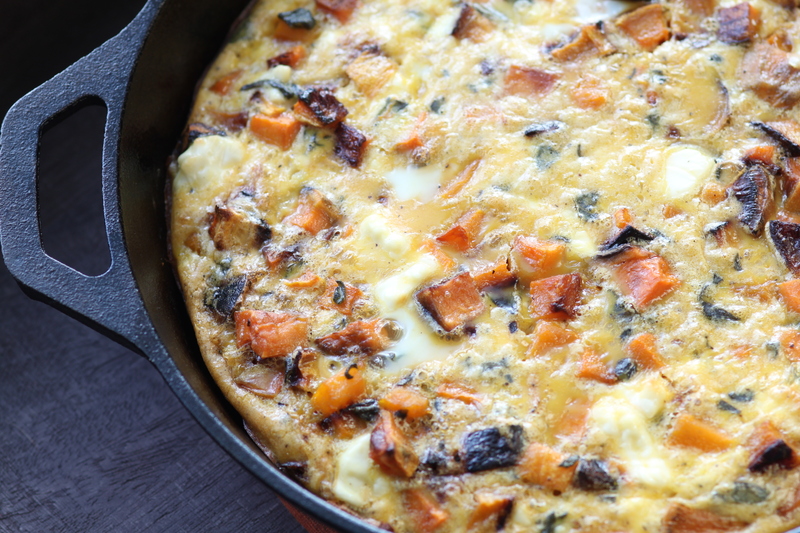 And instead of raw carrots, try shredded or steamed carrots. Easy! Hygiene! Whether you're wearing braces or not, it pays to avoid eating too many sugary foods - especially if those foods are sticky and tend to get stuck in the nooks and crannies around braces. Things like chewy candies can linger around your braces and be very difficult to clean off. These can lead to white spot lesions or even cavities. In addition, it's a good idea to limit sugary beverages like Gatorade and soda. This is especially true if you tend to sip your beverages over the course of several hours. Generally, if you are going to have a sugary drink, it's wise to drink it with a meal, limit the duration of exposure, and rinse with water immediately after. Then brush at your next opportunity in order to remove traces of the sugar. If you follow these simple instructions, you should have great success with the comfort, function, and cleanliness of your braces without making any major changes to your lifestyle or missing out on your favorite foods! As always, please visit our website for more information. 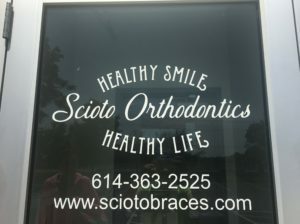 You can find us at www.sciotobraces.com. Happy eating, friends! Many parents are surprised to learn that their child might need braces as early as age 7 or 8. Lots of these parents remember getting braces themselves around age 12 or 13, and their initial reaction is, "That seems really young for braces. I didn't need them that young. We're going to wait." Waiting until 12 or 13 is still the right choice in lots of cases, but there are a few problems that require intervention sooner. We only recommend early treatment in cases where we know we're likely to get a better long-term result by taking action sooner rather than later. Today we're going to discuss one of these types of problems, the anterior crossbite or underbite. 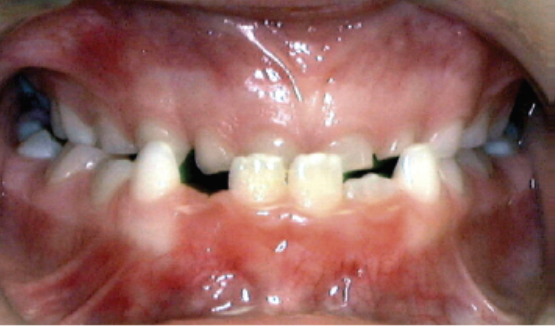 Anterior crossbites can be caused by a couple of different problems. Sometimes they result from disparities in jaw growth between the upper and lower jaws. This is significant because at age 7 or 8, we have the greatest likelihood of being capable of influencing the patient's jaw growth. As they get older, it becomes increasingly difficult and the results are less robust. In severe cases, early intervention may be able to help the child avoid requiring a surgical correction later in life. Another possible cause of an anterior crossbite is the misalignment of teeth in jawbones that are growing normally. If upper teeth erupt into the mouth but are tipped too far back or lower teeth erupt that are tipped too far forward, an underbite can result. Once the teeth have come in with this relationship, they will not self-correct. In fact, they will only get increasingly "set in their ways" if you will as time goes by. This means that they will become increasingly difficult to correct. In addition, leaving these teeth in the wrong positions for too long can lead to other unrelated problems. For example, lower teeth that are trapped in a forward position are more likely to experience recession of the gums or mobility. If your child is experiencing any of these problems, it's a wise choice to speak with an orthodontist. In our office, like most offices, consultations are free, and you will at least leave armed with the knowledge you need to know whether you want to proceed with treatment or allow more time. As always, we welcome your calls and emails if you have any questions! Spring sports season is in full swing these days, and we get lots of questions about how braces will influence playing sports. These questions usually surround concerns regarding 1) injury, and 2) time spent wearing elastics and retainers. In the case of many sports, especially those involving lots of contact like basketball and wrestling, or those involving balls and/or equipment that could accidentally contact a player's face, parents are wise to seek extra protection for their child's teeth. Generally we advise that any sport that recommends a mouthguard, even if it isn't a requirement, is a sport in which the player should definitely be proactive about protecting his or her teeth. Certainly, you want to be cautious even without braces. Any patient can experience an injury that leads to the loss of or damage to a tooth or teeth. With braces on, the risk of injury to the lips and gums are also increased because of the extra appliances in the mouth. Wearing a mouthguard can reduce the risk of teeth being broken or knocked out. In addition, the plastic from the mouthguard separates the braces from the lips, helping to avoid cuts and soft-tissue injury. Sometimes wearing a mouthguard can be more challenging with braces. There are ready-made orthodontic mouthguards available that you can invest in with special grooves where the braces fit. You can also use a traditional boil-and-bite mouthguard with braces. The way you fabricate your guard will simply be a little bit different. Before biting into the warm mouthguard, take a strip of wax and lay it across your braces. 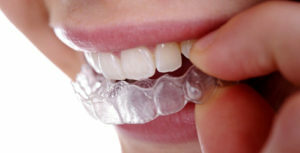 This will prevent the plastic from flowing into the grooves around the braces and wires and becoming difficult to remove. 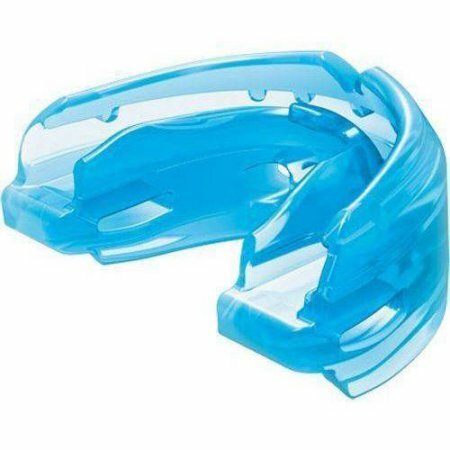 Finally, there are some appliances that we use in conjunction with braces (like the Forsus appliance, for example) which make it difficult to wear a full-length mouthguard. We advise, in these cases, that you cut the back portion of the mouthguard off to shorten it slightly and make it possible to fit in with your appliance. If an injury does occur, your first call should be to your general or pediatric dentist who is the expert in assessing damage to and repairing the teeth. They may take an x-ray to ensure that no teeth or bones have been broken. If a tooth has broken or knocked out, they will recommend the proper course of action. In many cases, the orthodontist may be involved in the recovery as well. Sometimes if a tooth has loosened due to injury, the braces can be used to stabilize the tooth, and your dentist can advise you if they'd like you to see us to assist with this stabilization. In addition, once the risks to the teeth, lips, and bones have been addressed with your dentist, you should also evaluate to see if any braces or other appliances are broken or loose. If so, as with any other broken appliances, you should give our office a call, and we can advise you on whether you need to come in right away or if the breakage is minor enough and can wait until your next visit for an easy repair. As I mentioned, another concern that often arises during sports seasons is finding time to wear things like elastics and retainers. If a mouthguard is required for your sport, then this takes precedence over the use of any special appliances! We always give permission to leave rubber bands and retainers out while you're engaged in playing your sport. (If you play a non-contact sport (like track and field) and feel comfortable wearing your rubber bands or retainers, it's ok to go ahead and keep them in, but we do not require it.) Often, especially for serious athletes, there can be many hours spent each day on practices, games, and meets. It's can be challenging to find enough time to wear your appliances, but rest assured that it can be done! We suggest keeping extra bags of rubber bands around at all times and putting a fresh pair in every time you have an opportunity. At a tournament all weekend? Make sure the rubber bands are in between games. Even if you only have half an hour, it's important to put them back in and let them keep working. By making the effort, you can still make progress during your sports season, or at least avoid taking a step backwards! So what should we do about this? Well, the best defense is a good offense! In other words, I'm saying that prevention is key. White spots are difficult to treat once they've occurred, so avoiding them in the first place is your best bet. Here are some tips for avoiding white spots! Parents should help, especially for very young patients. I meet lots of parents who are eager to put all the responsibility for brushing in their child's hands. In some cases, however, the child isn't interested in being compliant, or doesn't yet have the necessary skills to do a good job. In these cases, it's important to remember that as the parent, it will be your responsibility to monitor their brushing and flossing routines and help them if needed. Avoid excessive sugary foods and drinks. Sugar contributes to plaque and bacteria formation on the surface of the teeth. It's ok to enjoy as a treat here and there, but you should avoid consuming sugar continuously throughout the day, and you should always brush (or rinse with water if you can't brush right away) after enjoying sugary treats. Try using the special toothbrush we offer when you start braces! We use a special toothbrush when starting treatment with braces. It's specially designed to make it easier to brush under the wires and around the brackets so that you can be more effective at removing plaque. Watch for bleeding or puffy gums. These can be indications of inflammation which often means that brushing and flossing aren't being done effectively enough. If you're trying your hardest and still seeing results like this, please let us know. We'd be happy to review instructions as many times as you need us to! A Waterpik might be your new best friend. Waterpiks are gaining increasing popularity for good reason. They're fun for kids, and they do a great job of irrigating in hard to reach places! Feel free to ask for feedback on your brushing. We are here to help you. If you aren't sure how you're doing, let us know! We'll be happy to check and point out areas for improvement! What is DIY Orthodontics, and Should I Try It? The popularity of at-home, do-it-yourself orthodontic treatment has increased dramatically in the past year, and we can imagine you might have lots of questions about this method of treatment! You hear advertisements on TV describing how easy and inexpensive mail-order orthodontic treatment is. (Saving you all those "pesky" visits to a dental professional's office... ) And you may also hear dentists and orthodontists warning against the risks of DIY orthodontics, but perhaps it isn't clear what the risks are? So today, I'm going to break down a few of the unanswered questions based on my current understanding. First of all, let's define what we're talking about. What is DIY orthodontic treatment? Thirty or forty years ago, DIY orthodontics may have consisted of a dentist telling Mom to save her money on braces and have her son or daughter hold a popsicle stick in their mouth while watching TV at night to correct a crossbite. So DIY orthodontics isn't a new idea, but it has at least gotten a little more advanced! In this case, I'm referring specifically to mail-order clear aligners. These are marketed as invisable aligner treatment without the need to visit a doctor's office. You fill out a form online and pay a nominal fee to request some materials from the company. They send you a kit that you use to take an impression of your teeth at home. You send the impressions back, and they propose a treatment plan. You then have the option to view a video animation of how they expect your teeth to move and pay for the aligners if you want to. They are reportedly reviewed by a licensed dental professional, but you will monitor your own treatment at home. I don't have any first-hand experience with these companies, but I'm guessing (and hoping) that they remain available for questions throughout your treatment. So, what are the advantages that they advertise? Convenience - The company advertises that you can skip trips to the orthodontist's office. Is this true? Perhaps. If you take an excellent impression of your teeth on your own and your treatment goes seemlessly, you may avoid trips to an office! Here are a couple things to keep in mind. Taking impressions is something that does not have a 100% success rate even for orthodontic techs and doctors who have done it many times before. If you end up needing help or a digital scan (rather than an impression), you may end up visiting an office or a shop or kiosk to have this part of the work performed. Also, keep in mind that during clear aligner treatment in most orthodontic offices, you only need to visit about every 8 weeks and likely for no longer than half an hour or so. Cost - The company also advertises that you'll save lots of money compared to traditional orthodontic treatment. Is this true? Perhaps. You are essentially eliminating a middle-man. But is this a good choice? Eliminating the middle-man when you buy airline tickets or books online is great because you get the same product either way. With orthodontic treatment, when you eliminate the middle-man, you also eliminate a person who can give you customized personalized advice, guidance, and help getting the results you want. You may save money, but it's hard to guess whether you'll get the same value out of your treatment. There are likely cases where equal success is achieved, but more often than not, aligner treatment does not go precisely as planned, and the in-person help of a professional can help get you back on track. And what are the disadvantages we've been talking about? Worsening of dental health - Before beginning orthodontic treatment, an orthodontist should perform an exam and/or consult with your general dentist to be sure that your teeth and jawbones are healthy enough for tooth movement. If they are not, moving your teeth could lead to tooth loss, recession (gum problems), or mobility of teeth. In addition, orthodontists monitor your treatment throughout the process to be sure that your teeth are moving to a healthy position. If they aren't biting properly, adjustments need to be made, and sometimes treatment plans need to be revised in order to prevent bite problems. Cost - Yes, I mentioned cost as both an advantage AND a disadvantage. It's great if your treatment goes smoothly - you will probably save money! However, if you complete treatment and aren't satisfied with the results, as has been the case for many patients, you may find yourself in an orthodontist's office anyways, looking for another treatment option and facing the possibility of paying for treatment all over again. So, should you try it? We are obviously fans of treatment that is supervised by an orthodontist, but most importantly, we just want you to be aware of the risks and benefits before you make the decision to try this type of treatment! And if you decide against it or if you've already tried it and you're not satisfied with the results, we are still here for you! Dentistry and Orthodontics - Two of the Best Jobs in the Country! In case you missed this little blurb of news recently, we were excited to see the U.S. News Report's latest list of Best Jobs for 2018! We saw great news for dental practitioners and healthcare workers of all types! The report bases its rankings on many factors including job satisfaction (work-life balance), compensation, and job security. And the good news? The report lists "Dentist" as No. 2 overall and "Orthodontist" as No. 5! So, why are we so excited to share this news with you? Well, as it turns out, one of the awesome things about being an orthodontist is that we have a chance to meet lots of young people! As our patients progress through elementary, middle, and high school, they often start to think about what kind of job or career they might like to have, and we hope that we can be one resource for them as they make this extremely exciting decision about the direction of their lives. Try to learn as much as you can about a day in the life of a dentist or orthodontist. Usually, our first experiences with these jobs come from being a patient in the office. If you've been a patient in our office, you've probably started to get a good idea of the type of things an orthodontist does throughout the day, but you likely haven't seen behind the scenes yet! Outside of the time that the orthodontist is with you at the chair, he or she has a lot of other jobs to do and hats to wear. We are often found planning treatment, communicating with other dentists and specialists about cases, and doing the myriad jobs that come with owning and operating an office. Feel free to ask questions or see if you can spend time shadowing! Aim to maintain excellent grades. Even if you're only in high school, keeping your grades up will increase your chances of becoming a dentist or orthodontist. The process begins with an undergraduate education, and you can focus now on getting into a good college with a great pre-dental program. If you're already in college, grades become even more important as dental schools will use this data to help decide who will get a spot in their program. In addition, you can study hard to prepare for the pre-dental entrance exam (DAT), another factor dental schools will use to evaluate your application. Spend some time on extracurricular volunteer work or research. Dental schools love to see that you have interests outside of school too! When it's time to apply, be sure to share your interests with them - especially if you've been involved in organized extracurricular programs like volunteer work. Dental schools look for candidates who they believe will become dentists who are contributing members of their communities one day. And doing research in a science field through your university shows that you are academically capable of more than simply taking tests - you are capable of giving back to the field by producing new information and knowledge! There are many more ways you can learn about and prepare for a career in dentistry or orthodontics, and we are always happy to answer questions. Even if you just want to know what it's like to do our job - we're happy to chat! There are pros and cons as with every job, but overall, we think that a No. 5 spot on the Best Jobs lists is well-justified! We feel so lucky to do what we do every day and share our passion with our amazing patients! Any time we do a consultation for treatment with braces, one of the most common questions we receive is, "How long will I have to wear braces?" Of course, this is no surprise - we would want to know the same thing! The answer is complicated! Your treatment time depends on several things, most importantly, the complexity of your case. If you have a more severe bite problem than your best friend, odds are that you will wear braces for a longer time frame. In addition, everyone's teeth move at different speeds. As with all biological processes, our bodies differ from one another's. Your teeth will move at a pace dictated by your biology and the amount of force applied. While you don't have the ability to control these factors, the good news is that there are lots of variables that you can control about the speed of your braces! Whenever I explain the duration of braces to patients, I tell them that there are three major things they can do to influence the speed of their treatment. Here are my recommendations for speedy treatment! Show up to your scheduled appointments! When you skip or reschedule appointments, we don't get a chance to do necessary adjustments. We choose your appointment intervals carefully, and without coming at the necessary time, your braces may reach a plateau during which they aren't continuing to help you make forward progress. Even worse, if you continue to wear elastics or other appliances without supervision, your treatment could actually take a step backward, adding time to your treatment! Be careful to avoid broken braces and appliances. Any time a brace or other appliance (springs, etc.) come loose, that means the brace or spring isn't doing it's job. When the appliances aren't doing their job, then your teeth may not be moving the way they're supposed to, or even worse, they could be relapsing back towards where they started, adding time to your treatment. The best way to avoid breaking appliances is to eat carefully and choose foods that aren't too hard or chewy. If something does come loose or break, it's a good idea to call the office and find out whether it needs to be replaced right away or if it can wait until your next visit. Always follow at-home directions carefully. What do we mean by this? It means wear those rubber bands!! When the doctor asks you to wear rubber bands (elastics), be sure to follow the directions to the letter. They only work properly if they are attached to the correct teeth and worn for the proper number of hours each day. If you forget exactly how your rubber bands are supposed to attach, give us a call, and we can guide you. Don't fall into the trap of just hooking them up the same way your friends do - everyone is asked to wear them in different patterns depending on your teeth! And most importantly, if you are asked to wear your rubber bands full time, be sure you're getting about 22 hours each day. Less than full-time wear means your teeth won't be making any progress! Knowing what to expect at your first visit to the orthodontist can go a long way towards calming the anxiety of patients (children and adults) and even parents! Young patients may not know what an orthodontist is or does. They have often heard scary stories from friends about braces hurting or being "tightened," and they may be worried that they'll get braces right away and that the process will hurt. Adult patients are often nervous because they're still not sure what options they'll have, and they're still wondering whether they want to wear braces as an adult. "Why am I here? Am I really going to go through with this? Is it weird for an adult to wear braces?" (Spoiler alert - it's not!) And parents are frequently nervous about having sticker shock because of their preconceived ideas about braces being expensive. You'll be greeted by one of our staff members! One of our staff members will welcome you to the office and give you a tour. We'll show you everything you need to know to feel comfortable in the office. Once you've started treatment, often the orthodontist's office can start to feel like home! Once you've gotten settled, we'll be sure that you have completed all the new patient paperwork necessary. If you've printed this in advance or filled it out online, you may already be done! Our treatment coordinator will take photographs and x-rays of your teeth. We take a series of photographs of your teeth and face to be used by the doctor during diagnosis and also as a visual aid for you to use when discussing your treatment options. Sometimes it's much easier for you to see and identify problems with your teeth in pictures when compared to simply viewing them in the mirror. In addition, we always use a panoramic x-ray (one large view that shows all your teeth). One of the doctors will examine your teeth and bite and discuss your treatment options with you. Dr. Bethany or Dr. Liz will sit down with you and discuss your treatment needs, answer questions, and give you options for treatment, explaining the pros and cons of each option and giving you time to decide what's right for you. Our treatment coordinator will explain scheduling and financing treatment. Our treatment coordinator is here to do exactly that - to help you coordinate the details involved in starting treatment! She will review the total amount of your investment in treatment, help you understand how much your insurance will assist, and give you plenty of payment plan options. We are extremely flexible when it comes to financing your treatment because we know that everyone's budget is different, and we don't want that to get in between you and the smile of your dreams!! Next, she'll help you schedule any appointments needed to start your treatment. Sometimes, if time permits, you may have the option to start your braces the same day! One of our primary goals is to make your experience with orthodontic treatment comfortable and enjoyable! We're here for you along the way and we're always available to answer questions. We're looking forward to your first visit - and we hope you are too!! What is an Orthodontist, and Why Should I See One? I have talked to plenty of patients over the years who have been a little bit confused about the difference between an orthodontist and their general dentist. In some cases, when the patient's dentist does some orthodontic treatment, they will even tell me, "Well, my dentist is also an orthodontist." And I can see why they're confused! Dentists are the go-to providers for several types of procedures. For example, routine maintenance visits with your dental hygienist are nearly always performed at your dentist's office. The dentist is likely the person who should repair cavities, extract some teeth, and often provides restorations like crowns, bridges, and dentures. While this is the bread and butter of basic dentistry, they are also trained to perform treatment for all types of problems including root canals, minor surgeries like tooth extraction, periodontal treatment, and orthodontics. Each dentist provides these treatments at their own level of comfort, preference, and expertise, often depending on what type of additional training they have chosen to pursue. However, there are also specialists for each of these types of treatment who limit their focus to exclusively work in their one area of dentistry. As a result of their additional training and limited focus, these specialists are generally the best equipped to handle a wide variety of cases from minor to severe. They will usually have a vast array of treatment options and tools at their disposal because their practices are focused very specifically on addressing the problems of their specialty. An orthodontist, as well as all other dental specialists, begins their training by completing the four years of dental school. After dental school, each new doctor can choose to begin practice as a general dentist or to enter a residency program either to enhance their skills as a general dentist or to enter a specialty like the ones I mentioned above. To become an orthodontist, a dentist must complete a full-time residency of 2-3 years after dental school. During their residency, they spend time learning theories on tooth movement, becoming familiar with the most up to date tools of the trade, understanding the biomechanics of tooth movement, and most importantly, treating lots of orthodontic cases alongside trained faculty members. Upon completing residency, these doctors are well-prepared to diagnose and treat almost any type of bite problem and even some facial deformities. They are also trained to work on teams alongside the patient's general dentist and in some cases surgeons, periodontists, and other specialists when the situation calls for a multi-disciplinary treatment approach. What does this mean to you as a patient? If you are interested in tooth movement performed by an orthodontist, whether for esthetics or function, we recommend finding an orthodontist in one of a few ways. First, consider asking your dentist for a recommendation. You can also try visiting the American Association of Orthodontists' website, mylifemysmile.org, and search for an AAO member orthodontist in your area. It doesn't hurt to ask friends for referrals as well or to visit good old Google and check out the reviews for local orthodontists. When in doubt, call the office and ask any questions - odds are they will be happy to help you learn about their office and guide you through the process. Good luck beginning your braces journey! !